The 1930s decade saw continued activity toward fulfilling the "home-workshop movement", but the forces driving progressive education had softened. During the twenties, as the intellectual avant garde became fascinated with the arts in general and Freud in particular, social reformism was virtually eclipsed by the rhetoric of child-centered pedagogy. During the thirties, when influential groups within the profession sought to tie progressive education more closely to political Progressivism, the movement was racked by a paralyzing partisanship from which it never fully recovered. After World War II, the added curse of inertness cast its pall over the enterprise. By the 1950's the enthusiasm, the vitality, and the drive were gone; all that remained were the slogans. source: Adapted from Lawrence A Cremin, The Transformation of the School: Progessivism in American Education, 1876-1957 New York: Knopf, 1962. (This 1962 book -- it won a Bancroft award -- is not online full-text. To illustrate some important evidence that shows the "who", "what", "when", "why", "how" of this movement, I am adapting material from Emanuel E Ericson's Teaching Problems in Industrial Arts Peroria,IL: The Manual Arts Press, 1930. Ericson is a leading theoretician of IA in this era of change in the discipline. As well as Ericson, William Klenke -- the photo on the left is from #1: The Home Workshop -- along with other prominent figures in Industrial Arts, such as Herman Hjorth, Verne Fryklund, William Johnson, and Louis Newkirk, promoted the homeworkshop movement by including in their Woodworker's manuals -- designed for IA classroom use -- chapters discussing various aspects about how, in general, courses could be created for high school boys that involved grading their activities in home workshops. 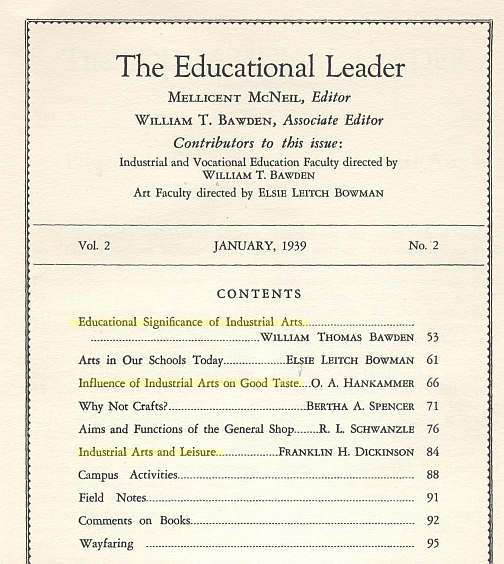 Ericson's 1930 textbook, Teaching Problems in Industrial Arts devotes several chapters to the matter. Since this textbook is not yet online, I have created a pdf of the relevant pages that cover. "credit for the home workshop"
Another source is the 28-page booklet, "The Small General Shop for the Modern School", issued in 1931, by the South Bend Lathe Works. While woodworking is one of five other "shops": (1) machine shop; (2) electrical shop; (3) forging shop; (4) motor mechanics; (5) mechanical drawing, clearly the boolklet's contents demonstrate a close working relationship between South Bend Lathe Works and leading figures in Industrial Arts education. Designed for rural or small town school systems, the booklet takes local school officials step-by-step -- including the obvious suggestion: "purchase your shop equipment from South Bend Lathe". Based on the "Project Method", the package includes ready-made "Job/Instruction Sheets" -- a "job sheet" for "machine shop" is illustrated on page 16 -- and the booklet explains that "Job sheets explain the work step by step from start to finish, following the methods used in Modern Machine Shop Practice". In addition, several classroom texts are highlighted, including Louis Vest Newkirk and George Dinsmore Stoddard, The General Shop, Peoria, IL: The Manual arts press, 1929. Now considered one of the standard means of employed in shop teaching, Instruction Sheets make possible changes in shop organization and layouts that allow a variety of mechanical activities in woodwork classroom schools in place of the old program activities. The value of Instruction Sheets is not doubted, and it is puzzling why the introduction of IS into woodwork courses took so long. The use of IS range all the way from using them as a complete substitute for -- on one hand -- all personal instruction to -- on the other hand -- simply an auxiliary to instruction. In the box below are the first two paragraphs from Paul V Woolley's 1925 Bibliographic Guide. Notice that while Woolley makes no no mention of Instruction Sheets as a significant aid to individual instruction, their usefulness is strongly implied. Several years' experience teaching and supervising academic as well as shop subjects, has convinced the author that to be effective and successful in any line of work one must be able to find the information needed when one wants it and to do it quickly. For the busy teacher, particularly, both in the class room and in daily preparation, it is often hard to ascertain the several references he should read and present to his pupils. Often we do not know just where to send a pupil to find the answer to his question, or just where to make our assignments for outside reading and special reports. It is, therefore, the author's aim in the production of this book to provide a real time-saver as well as a reliable means of helping teachers and students to higher success in the field of woodworking. Woolley was Head of the Department of Manual Arts Filson High School Muncie, Indiana. It was in the concept of the General Shop where Instruction Sheets were used most extensively, their use not confined to that particular type of classroom organization. The 28-page booklet, "The Small General Shop for the Modern School", issued in 1931, by the South Bend Lathe Works. While woodworking is one of five other "shops": (1) machine shop; (2) electrical shop; (3) forging shop; (4) motor mechanics; (5) mechanical drawing, clearly the boolklet's contents demonstrate a close working relationship between South Bend Lathe Works and leading figures in Industrial Arts education. Designed for rural or small town school systems, the booklet takes local school officials step-by-step -- including the obvious suggestion: "purchase your shop equipment from South Bend Lathe". Based on the "Project Method", the package includes ready-made "Job/Instruction Sheets" -- a "job sheet" for "machine shop" is illustrated on page 16 -- and the booklet explains that "Job sheets explain the work step by step from start to finish, following the methods used in Modern Machine Shop Practice". In addition, several classroom texts are highlighted, including Louis Vest Newkirk and George Dinsmore Stoddard, The General Shop, Peroria, IL: The Manual arts press, 1929.
fifth, administrators who wish a conception of the place of the general shop in the educational program. The term, general shop, in its early usage referred chiefly to a shop arrangement which provides for more than one activity to be carried on simultaneously under the direction of one teacher. The content and equipment were taken bodily from the unit-shop courses, and the general shop was in the main a series of unit shops shrunk until they would all fit into one room. It need only be mentioned here that with the coming of the junior high school, and the development of its content to meet the life needs of pupils who are sampling widely of the world's educative experience, the term general shop is taking on a new meaning. It is not fundamentally analogous to a series of unit shops, but is a new concept in the industrial arts field, with special functions to perform in giving pupils educative industrial-arts experience of a sort which the typical unit shop was never intended to give. The authors wish to express their thanks to all who have helped directly or indirectly in the preparation of the manuscript. Much credit is due the authors' students who helped prepare the individual instruction sheets in Chapter II. Professor F. G. Higbee of the College of Engineering, University of Iowa, generously reviewed portions of the material. Professor T. J. Kirby, director of the University of Iowa High School, has given many valuable suggestions and made it directly possible to carry on a general shop. Dean P. C. Packer of the College of Education, University of Iowa, has been very helpful as to policy, and has been instrumental in providing the material equipment necessary to carry on the experimental work. Ericson argues that Instruction Sheeets should be employed in many types of schools or shops, as part-time continuation schools, evening classes, in the unit shop of the junior high school, and in all-day trade-preparatory classes. Instruction Sheets have limitiations. While such sheets constitute a most valuable teaching device, IS are not intended to supersede all other forms of instruction. Instruction Sheets required considerable preparation, with the work by students organized with this specific method of teaching in mind. ... [T]he newer philosophy of education ... [was] the shifting of the emphasis from class instruction supplemented by individual instruction to individual instruction supplemented by class instruction. Attempts were made at first to solve the problems of class instruction by means of individual oral instruction, but the method imposed considerably more work upon an already busy teacher. Since the period of the World War many forms of written instruction sheets have appeared in an effort to improve the efficiency of instruction. Source: Verne C. Fryklund, "Instruction Sheets and Principles of Teaching," Industrial Arts Magazine 16, no. 2 February 1927, pages 41-44. 1. Instruction-sheets are a means for offering a greater variety of work in the shop. Such variety could not be covered by individual personal instruction. 2. They save time of the teacher. The time so saved can be used effectively in perfecting organization, and in other phases of the work. 3. They save time of students that would otherwise be used in waiting for attention of the instructor. 4. Interest of students is maintained, because they can proceed with the work without waiting for demonstrations and personal instructions. 5. They furnish printed directions to be followed. Success in a great number of occupations depends upon ability to understand and follow directions set forth in this way; consequently the practice is of high importance. 6. Students are left on their own resources in carrying out the work. The habit of "leaning on the teacher" at all times does not produce an adequate sense of independence. Our schools are now being criticized by industry for failing to develop initiative and self-reliance. 7. Instruction Sheets are of great value as an aid to and follow-up of the demonstration. They eliminate the need for copying directions, and thus enable students to concentrate upon the processes demonstrated. They also serve to establish uniform checking levels in the progress of the work. 8. If standard instruction-sheets are used, it is likely that they are better organized with reference to pro­cedure and other material than would be the oral instructions of the teacher. 9.They assist the teacher who might not be expert mechanically with reference to all phases of the work. Such shortcomings on the part of the teacher are unavoidable in the early stages where a great variety of operations is covered. As Knoll's timeline shows, the Project Method has been used successfully for many generations, with all ages and grades, from the kindergarten to the college. In manual arts the method has been used to a greater or lesser degree throughout the entire history of the teaching of this subject, although the method has not always been recognized by this name. We need point out that the general interpretation of the term "project" in shopwork -- meaning any article produced in the shop -- has no connection with the "project method" as here interpreted. (b) practice social and democratic modes of behavior. Genuinely a product of the American progressive education movement, it was described in detail and definitively delimited for the first time by William Heard Kilpatrick in his essay, "The Project Method", cited below. .
(3) furnishes its drive, its inner motivation." Source: William Heard Kilpatrick, "The project method", Teachers College Record 19 1918, pages 319-335; see also Church & Sedlak, 1976; Cremin, 1961; Röhrs, 1977. We might define `project' as an intellectualized, whole-hearted, purposeful unit of activity proceeding to completion in a social environment or natural setting. Source: Laubach, M. L., "The Project Method of Teaching in Industrial-Arts Work," Industrial-Arts Magazine september, 1925. Four steps of procedure in the development of a project are suggested by the author. These are also pointed out by Kilpatrick in connection with projects of the so-called "producer type." Source:William Heard Kilpatrick, Foundations of Method New York:, Macmillan, 1925, pp.344-355. In the light of the definitions quoted, recall that these four steps are to be taken by the student, the learner, and are not specified for the teacher. This understanding does not relieve the teacher of responsibility, just because the project method has been accepted. Nor does it mean that all methods of teaching previously discussed are to be entirely disregarded. Instead, it meant that, undeniably, the Project Method puts the student at the center, with the teacher the "stage­hand," so to speak, ready to assist in developing the performance. Further consideration of the four steps or stages of the project will make this point clearer. If the purpose for the work is to be proposed and planned by the student, then it means that the instructor becomes the guide, an inspiration, if you will, a lead for students to think in the right direction, rather than the one to announce the purpose for their thinking. "How" the student learns is equal to "What" the student learns. "It is just as much the duty of the junior high school teacher to imbue pupils with a worthy purpose as it is to teach subject matter. A teacher must be expert in both. Purposes must not only be recognized and accepted by the teacher, but also by the pupils. Unless the latter accept and appropriate the purposes as their own, this first important step in the project method will fail. Source: John F. Friese, Exploring the Manual Arts, New York: Century Company, 1926, page 267. To illustrate, Ericson mentions this example: let's assume that a group of boys "realize a need" for a bicycle-rack on the school grounds. (In those days, bicycle-racks cous have been made of wood,too!) In reality some one else, probably the instructor, was the "instrument" that caused the students to "realize a need" for it, and assume the responsibility for constructing the bicycle-rack. The "inspiration", though, comes subtley from "behind the scenes", rather than from instructor. In the setting of the Project Method, the outlook shifts dramatically, from what it might have been had the teacher announced that "a large bicycle- rack is our next project", to a context in which students take the initiative; otherwise it would not have been an example of the project method at all. "Whatever influence the instructor might have had, then, the purpose must come from the 'inner urge'; it must be 'whole-hearted'." The Plan of the Project. Now, instead of the teacher making the statement, "I will furnish you a drawing for the rack tomorrow," which he might do under the purely imitative method, he will probably ask the class what the next step will be. Obviously they cannot begin to work without a plan. But theirs is the joy of planning, and one who has not witnessed the zest that young pupils will put into the planning process has missed some of his rewards for being a teacher. And who knows, after all, which is the most important factor to the majority of students, making the plans, or executing them? The planning will not be confined to the sketch or drawing for the article to be constructed, but will cover also kinds and amounts of material, and orders through which it may be purchased; as well as a com­plete analysis of the steps involved in construction, and perhaps the division of labor necessary; and the appointing of a foreman. This may include writing job-sheets. Such procedure will obviously bring students in contact with many phases of life and occupations which they would not touch if the teacher were to take the leadership and direct the job on a commercial-pro­duction basis, using the students as helpers, and teach­ ing through direction and imitation. To be sure, the teacher must use his judgment with reference to the information that the students will be required to ob­tain for themselves. If he possesses tact and appreciation of this method, he will not allow overdifficult problems to destroy the interest of his pupils. The objection raised by some that too much time is consumed by this method, with too little finished product turned out, is founded, usually, either upon a desire to show results and have fine exhibits, or upon years of trade practices and experience through which the teacher has become saturated with the cry of in­dustry that production must be stressed. The Execution of the Project. If the planning has been carefully done the opportunity will now pre­sent itself to see plans materialize, to see one's imagi­nation take form. Here, as under the previous steps, the teacher may and will be called upon to "show how," to demonstrate tool processes perhaps, and to offer suggestions with reference to methods of con­struction. These are all legitimate phases of his ac­tivities, provided that the students realize the need of his assistance. Obviously, a project such as this would be based upon previous tool practice, obtained perhaps through imitative procedure. If the necessary skill is not pos­sessed, it will be folly to stand by and have the stu­dents develop bad habits in handling tools and fail in standards of workmanship, because of the feeling that the instructor must not interfere. Demonstrations of tool processes form the most reliable and direct way of enabling others to acquire mechanical skill. Such demonstrations, particularly on the individual-instruc­tion basis, become in such cases, a required phase of the steps in execution. Such teaching is sought after by the student in the same way as he obtains data from books and other sources. Judging the Results of the Project. By having an opportunity to judge their own work and that of others, students will achieve a better appreciation of the quality of their own planning and execution. To learn to evaluate one's own efforts in life is a valuable trait, and this can be accomplished without depreciat­ing the value of the teacher's judgment. As a matter of fact, students under normal conditions are eager to have the judgment of the instructor passed upon their work. A list of points under which such evaluation may be made is very helpful, and such a form can be made up by the class through a conference promoted and led by the teacher. Fig. 3 shows a type of "project" that has many possibilities for applying the suggestions de­veloped in this chapter. Place for the Project Method. The project method should receive consideration by shop instruc­tors as one of special value. In the junior high school it offers distinct advantages over the imitative pro­cedure in that it stimulates the pupil to reason and solve his own problems. To quote again from Friese, "If manual-arts teachers would but experiment with problem-solving methods, including the project method, they would be surprised at the added zest which would be given to their own part of the shopwork. Source: Friese, John F., Ibid., p. 274. For Ericson, properly taught, a student's shopwork in the school would encourage that student to create a workshop at home. But Ericson also acknowledges a truth for the 1930s: The home workshop among boys is not so common as it should be. shop instructors should spend a little time in their classes in encouraging this idea, then work out a bulletin covering needed equipment, and valuable instruction booklets, offering also their personal service to the boy and the home if need be, there is a likelihood that the effort would repay in interest developed in both pupils and parents. "It would add a little work", Ericson argues, but most ssignicant, "... be well worth it". Why? "Much of a boy's best education is received while working in a shed, or in the back yard, solving the problem of how to repair a toy-automobile or put together an alarm clock". Much of what Ericson argues in 1930 is, according the American psychologist, Edward S. Reed, of even greater import today, where the experience the boys in the image above are obviously getting is of even greater rarity today. Source: Edward S. Reed, The Necessity of Experience New Haven, CT: Yale University Press, 1996. Rhetorically in his textbook, Ericson asks, "Shall school credit be offered for work done at home?" The responses, he notes, are divided: Some teachers have been so brave as to say "Yes", and attempt to organize some scheme for checking homework. One method: personal visitation and inspection by the instructor. This is unquestionably a good plan, but only if it can be carried out. A second method: have a paper form for parents to fill out stating that the work has been done by the individual, and that it has been completed in a satisfactory manner. The second method is, of course, less reliable. Why? Because, for one, some parents lack of ability to determine whether a fair mechanical standard has been attained. But, second, more important, is -- in the desire to protect their children's grades in school -- the tendency of some parents to be judge the project subjectively. Ericson dismisses the idea, however, that such behavior by parents would be widespread. Not be enough parents would take advantage of the situation to jeopardize the procedure of giving credit for home work, if there exists a definite set-up for doing it. In his textbook, Ericson shows a form that could be used for validating work done by students at home. Ericson acknowledges that while a program such as the one he outlines comes with its problems built-in, it has the potential of a payoff that is worthwhile, regardless of the pitfalls. (2) that the National Homeworkshop Guild was launched in 1933 -- under the promotion by PSM, and that by 1930 about 500 chapter of club os woodworkers exist in the United States and Canada. Ericson and other teachers in high school woodworking had a lasting impact upon launching the woodworking movement in the 20th century. -- the first of a series of ten pamphlets -- "Things to Make and How to Make Them" -- published by The Manual Arts Press -- under Klenke's authorship, covering the construction of colonial revival furniture and related items. Take note that Klenke was one of several active promoters in IA that encouraged students to build American colonial revival furniture pieces, rather than the straight-line pieces of the Arts and Crafts movement. As well as the pamphlets that comprise the series, in 1930 Klenke publshed a small but impressive set of plans, Selected Furniture Drawings. The image below is from The Home Workshop, the first pamphlet in the series listed below, "Things to Make and How to Make Them". As well as being a high school IA instructor, Klenke was a practicing architect. His artistic talents are shown to advantage in this "poster" of lathe gouges and lathe accessories. The box below contains the text (adapted) off an article from a 1940 newspaper. Sometime in the future, I will set out the results of the findings of several master's theses on the home workshop movement's growth and activities in the 1930s. "Carpenter Attending 10th Successive Year Of Woodworking Class"
Spending more than one year in the same subject spells failure to most school kids; but not to 52-year-old Walter Krueger who is enrolled for his tenth year in the wood-working class at Appleton Vocational school. Mr. Krueger, a carpenter by trade, started out in the old building ten years ago to better himself in his work. He says that he got so interested in puttering around the shop, making things with his hands and working with wood, that he just kept on coming back every year. He has seen three instructors come and go and watched the woodworking shop develop from its earlier quarters into the efficient roomy place in the new trades building. He has made so many things during his four hours a week for the past nine years that he can't remember them all. Some of his handiwork includes the Martha Washington sewing cabinet that he is working on now, a kitchen set, end tables and several cedar chests. Mr. Krueger is the only carpenter in the class as well as being its oldest member. This year the class includes six farm boys, Mr. Krueger, a musician, two mill men, an art displayman and a clerk. Nearly all of them take the course to learn more about woodworking because they like to make things from wood. Frank Wilson, teacher of industrial education and science at Roosevelt junior high school, is the instructor of the class. Lowell: That the woodworking course, which opened last night in the high-school, under the sponsorship of the State Department of Education, University Extension, gained widespread favor was evidenced in the crowd that turned out for enrollment. More than 250 persons signed up for the course, which is the first of its kind to be conducted here. Peter E. Gutesian, instructor, stated that the class is one of the largest in the history of the division. The course will be held every Monday night throughout the winter. Notice that I have highlighted in yellow three of the articles, each of which focus on IA, especially woodworking, in a particular way: first "educational significance", second, fostering "good taste", and third, "leisure". A "woodworking-shop-on-wheels makes its rounds of schools and playgrounds in Pasadena, CA. Powered by a 110-volt circuit -- that is plugged into an available outlet -- the set-up is designed for model building and for teaching handicraft work in schools that lack workshops. The shop -- it sits a truck bed -- includes a circular saw, band saw, lathe, electric dril, and small planer. Its power is taken by a long cord from the regular 110-volt circuit of the school the truck is visiting.